STATE-OWNED Amanah Raya Bhd (ARB), unfazed by the current financial turmoil, aims to double the size of its property trust to RM1.3 billion next year. Chairman Datuk Dusuki Ahmad said ARB will buy properties that offer more than eight per cent yields for its AmanahRaya Real Estate Investment Trust (AR-REIT). 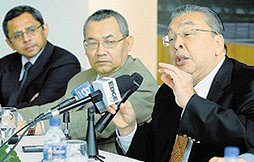 GROWTH PLANS: (From left) Ahmad Rodzi, Dusuki and Mustapha Kamal at the press conference. AR-REIT, listed in February last year and worth RM645.52 million, is the first state-owned property trust and Malaysia's second largest REIT. It is managed by ARB's asset management arm, AmanahRaya-JMF Asset Management Sdn Bhd, one of the leading fund management firms in the country with more than RM6 billion of assets under management. Dusuki said ARB is committed to growing the REIT and will buy properties in Selangor, including Cyberjaya, but cautiously. "The properties will be held under our own portfolio. When the time is right, they may be disposed of to the REIT," he said. He was speaking to Business Times yesterday after inking a deal with the Emkay group to buy two six-storey commercial blocks at MKN Embassy Techzone and Bangunan Mustapha Kamal in Cyberjaya, worth a combined RM266 million. The investments for commercial properties in Cyberjaya are the first for ARB. Emkay, controlled by developer Tan Sri Mustapha Kamal Abu Bakar, is developing Techzone, a 4ha information technology park, under a 60:40 partnership with Bangalore's Embassy Group. It features four purpose-built blocks worth RM350 million. Blocks A and B have been constructed and the other two will be ready by the end of next year. ARB is buying Blocks A and B, which have been leased for 10 to 15 years to the Public Service Department and the Malaysian Administrative Modernisation and Management Planning Unit. Bangunan Mustapha Kamal has a long-term tenancy agreement with the Education Ministry. "The buildings offer more than eight per cent yields per year, giving us reasons to want to pump them into the REIT," Dusuki said. Meanwhile, Emkay said it was considering launching Phase Two of Techzone, comprising eight commercial blocks sprawled over 8ha, adjacent to the four blocks. Dusuki said ARB may look at buying one or two blocks under the second phase. At a press conference later, ARB group managing director Datuk Ahmad Rodzi Pawanteh said it was in discussions on the possibility of further investments in Cyberjaya. He also said that it would be up to AR-REIT to consider injecting the three commercial blocks into its fund. "At this point, we are still keeping it in our (ARB) portfolio and will decide if we want to dispose of it later to the REIT." CYBERJAYA: The Emkay Group plans to construct eight office buildings in Cyberjaya with a total gross development value (GDV) of over RM800mil, as it sees great prospects for such properties in the area. Chairman Tan Sri Mustapha Kamal Abu Bakar said the buildings would be built on a 8ha-site and construction would probably start by end-2009. “The projects would take about six years to complete,” he said after a press briefing yesterday on the disposal of its three office buildings to Amanah Raya Bhd for RM266mil. The three buildings are Bangunan Mustapha Kamal and block A and B of MKN Embassy Techzone. Mustapha Kamal said the rental rates for office buildings in Cyberjaya were expected to grow further due to the aggressive development in nearby Putrajaya. “The rental rates in the area had increased to RM5 per sq ft from RM1 about 10 years ago,” he said, adding that demand for office buildings was still robust in Cyberjaya. On the impact of the global crisis, chief operating officer Peter Teh Heng Poh said the effect was minimal, as most of its projects had been sold. “There has been a slowdown in the demand of certain kinds of properties, such as apartments, in well-developed areas,” he added. Teh said the company would create more products that could cater to the needs of information technology companies and was currently involved in the development of data centres. Meanwhile, Amanah Raya group managing director Datuk Ahmad Rodzi Pawanteh said the company would lease Bangunan Mustapha Kamal to the Education Ministry for 10 years. “We are in negotiation to lease the two remaining buildings to government bodies as well,” he said. On the possibility of injecting the three buildings into AmanahRaya Real Estate Investment Trust (ARREIT), Ahmad Rodzi said the proposal was possible but the company would leave it to ARREIT to decide. Amanah Raya subsidiary AmanahRaya JMF Asset Management Sdn Bhd is the manager of main board-listed ARREIT. ISLAMIC lender Asian Finance Bank will set up aviation and property funds with more than RM1.5 billion, aiming to capitalise on demand for alternative assets amid the global financial crisis. As financial markets skid under growing fears of a global recession, some Islamic banks are ploughing on with expansion and fund-raising plans, reflecting a belief that the industry is relatively resilient to the meltdown. Asian Finance, which is backed by Middle Eastern shareholders, is planning a Gulf aviation fund which could be denominated in the euro or dirham, Asian Finance chief executive Mohamed Azahari Kamil said in an interview. It was too early to state the fund size, but it would probably be more than RM1 billion, he said, adding that the bank is working on the fund with some Gulf airport operators. "Aviation has always been a growth sector, particularly in the GCC (Gulf Cooperation Council member countries), because we believe there's potential in the transport business," Azahari said. "Because of the scarcity of liquidity, we need to also look at the possibility of doing a fund which is maybe non-US dollar denominated," he added. Asian syariah banks are aggressively wooing Middle East investors who want their money to be invested according to Islamic principles. Asian Finance said on Thursday that it will distribute a RM1 billion Islamic fund to allow Gulf investors to invest in companies in the Asean region. The move came in the wake of a plan by the Singapore unit of Kuwait Finance House, Kuwait's largest lender by market value, to raise US$600 million (RM2 billion) in Islamic funds next year to buy ships, stakes in private firms and properties in Asia. 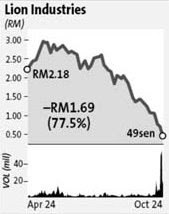 PETALING JAYA: Liberalisation of long steel imports earlier this year and falling global steel prices seem like a recipe for disaster for the Malaysian steel industry and the sector’s share prices have certainly reflected this. This week saw Lion Industries Corp Bhd being heavily traded and its share price tumbling by over 31% since Wednesday. The stock finished at 49 sen yesterday against Tuesday’s close of 72 sen.
Of the other steel counters that have fallen since Wednesday, Kinsteel Bhd shed 10% to 39.5 sen; Perwaja Holdings Bhd plunged 14.5% to 74 sen; while Ann Joo Resources Bhd, which saw trading volume start to spike on Tuesday, fell 27% over the four trading days to close at RM1.19. However, contrary to previous periods of turmoil in 2005 that saw alleged dumping by China-based steel makers with excess capacity, the current situation is more nuanced than one might imagine. OSK Investment Bank analyst Ng Sem Guan told StarBiz the global steel industry was more disciplined this time and he did not expect to see much dumping. Ng said the global steel sector, including China’s, had been experiencing strong earnings in the past two years and had the reserves to support a scaling back of production to maintain steel prices. “China also has high costs and globally we are seeing the industry making production cuts to overcome market factors,” he said. However, he conceded that the sudden onset of the US financial crisis would have some impact on the sector. “A cycle change in less than two months is definitely a shock to the industry but the government is liable to monitor the import situation,” he said. A Lion Industries spokesman attributed the fall in global steel prices partly to unexpected weather conditions. “We view the drop in demand beginning in the third quarter as seasonal due to weather conditions hampering construction activities in Asia and the Middle East. “The drop continued into the fourth quarter, mirroring growing uncertainties of underlying demand with the threat of a global recession and tighter credit facilities to steel traders and producers,” he told StarBiz. As for the immediate term, he said costs for raw materials such as scrap metal had also dropped concurrent with the fall in global steel prices and he expected margins to be impacted. Perwaja Holdings Bhd managing director Tan Sri Pheng Yin Huah disclosed that his company had also cut production. “Yes, worldwide steel millers are cutting production and we are of the opinion that this is a sensible and wise move. “It is wrong to perceive that the steel industry is troubled when steel millers cut production. The steel millers are adjusting their production according to market forces. “Overstocking does not benefit the millers. Perwaja is monitoring the situation closely and its production level will depend on the market situation,” he said. As for the industry outlook, Pheng said while there was still demand for steel products locally, it was “not as robust as before the credit crunch”. He said the steel demand was closely linked to the Malaysian economy, which had not adversely affected by the financial turmoil and was still recording growth. Meanwhile, Master Builders Association Malaysia secretary-general Yap Yoke Keong said domestic steel prices were still about 15% higher than in neighbouring countries. According to Yap, only the very large contractors in the country imported steel materials directly while the smaller players sourced from stockists. Going forward, Yap sees some slowdown in construction activities in the medium term as both the private sector and the Government adopted a wait and see attitude in executing their projects. SINGAPORE: Singapore private home prices fell 2.4% in the third quarter, worse than an initial estimate of a 1.8% drop as the property market weakened sharply at the end of September. Rents during the July-September period fell 0.9% after gaining 2.5% in the three months to June, the government’s Urban Redevelopment Authority (URA) said yesterday. Homes in prime areas registered the biggest price decline of 2.7%. “We know the property markets turned so the revised figures were not a huge surprise. It’s more than likely the fourth quarter will see a sharper decline,” said Song Seng Wun, Singapore-based economist at CIMB. The fall in Singapore home prices in the three months to September marked the first decline in four years and coincides with the economy’s descent into recession during the quarter. Demand for government built HDB apartments remained firm during the third quarter as prices gained 4.2%, a separate index from the Housing Development Board showed. The increase was, however, slower than the second quarter’s 4.5% gain.